Why are sun dried tomatoes so good? I recently have been buying the packaged ones at Trader Joes and throwing them in any dishes I can. I love all kinds of pasta- creamy, red sauce, white sauce, spicy, you name it. But sometimes, a simple pasta dish does the trick. 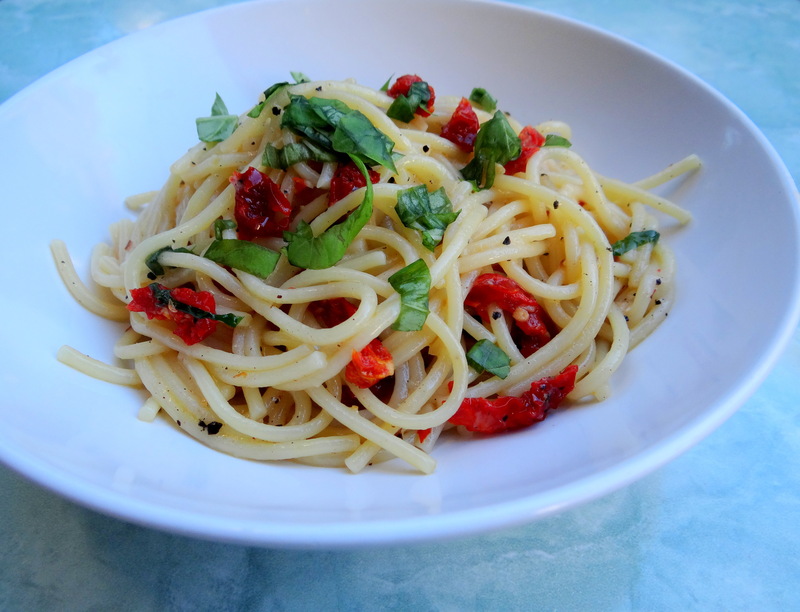 Back in August, I posted a simple pasta recipe for capellini with tomatoes & basil. This is basically the same recipe but you just substitute sun dried tomatoes for cherry tomatoes. It’s light, fresh & the tomatoes add a bit of sweetness to the dish. Yeah sorry I wasn’t too creative on this post but had to share my new found love for sun dried tomatoes. They’re also good in omelettes/scrambles, salads, and sandwiches. I’m not ashamed to admit that I ate this pasta and popped some more tomatoes in my mouth like a snack. Next Postthe pursuit of food- check out this trailer!